The rain on Saturday morning failed to dampen the spirits of staff members from more than 20 companies, businesses and organizations who participated in the Kings and Queens Netball tournament. 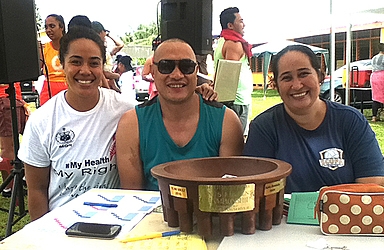 The tournament organised by the Samoa College Old Pupils Association (S.C.O.P.A) Netball Club saw enthusiastic players engage in a day of fun and laughter. “This competition is hosted by the S.C.O.P.A. Netball club as an annual event to end the year activities,” said Vice President of S.C.O.P.A. Netball Club, Diana Roma. She also said the money collected from this tournament and previous tournaments throughout this year would be put together to fund the construction of toilets and bathrooms in the school. Mrs. Roma acknowledged the supporters of the tournament. The Samoa College Old Pupils Association Netball Club continues to provide two scholarships to study in the school for the best netball players.